KUCHING: Sarawak finally has its own local-based political coalition in Gabungan Parti Sarawak (GPS) after 55 years in Malaysia – one that views itself as a partner to the federal government, says Chief Minister Datuk Patinggi Abang Johari Tun Openg. Speaking at the official launching of GPS here last night, the chief minister said setting up the new coalition, with only local-based political parties as its component members, is the direction Sarawak needs to take to move forward. “We (GPS) can work with any party for as long as the rights of Sarawak are respected,” he told a crowd of thousands at the State Indoor Stadium in Petra Jaya here. The four component parties of GPS are Parti Pesaka Bumiputera Bersatu (PBB), Sarawak United People’s Party (SUPP), Parti Rakyat Sarawak (PRS) and Progressive Democratic Party (PDP). At a post-launch press conference, Abang Johari, who is GPS chairman, said although the coalition subscribes to the concept of federalism, Sarawak needs to be recognised and acknowledged as one of regions that formed Malaysia. He said it is good for Sarawak to have its own coalition as GPS can have a strong say in certain areas as enshrined in the Federal Constitution and Malaysia Agreement 1963 (MA63). Abang Johari – also PBB president – added that GPS will carry on the fight of the late Pehin Sri Adenan Satem in recovering Sarawak’s rights. He recalled that Adenan used to say that the oil and gas resources in Kelantan and Terengganu were none of his business, but that he cared about the oil and gas in Sarawak. Because of this, Abang Johari said he had done his level best to defend the oil and gas rights of Sarawak, such as by imposing the five per cent sales tax on petroleum products. “Under the Tenth Schedule of the (Federal) Constitution, we have the right to impose sales tax on commodities, and oil and gas is our commodity. “With this five per cent sales tax, we will be able to increase our revenue by another RM3 billion or more,” he added. He pointed out that the added revenue would allow Sarawak to continue with infrastructure projects which had been cancelled by the federal government, such as the construction of the Batang Lupar, Rambungan, Igan and Kemena bridges. “You (federal government) can cancel all you like, but we, Sarawak, will take over. We will continue these projects. “You take credit for the development of the Pan Borneo Highway but Tok Nan (Adenan) was the one who requested for this mega project,” he said. During the launch, the chief minister unveiled the nine pillars of GPS, which are upholding the constitution, respecting rule of law, safeguarding Sarawak’s rights and interests, building prosperity and a greater Sarawak, practising political integrity and patriotism, strengthening Sarawak’s economy, fostering unity and peace, aspiring future generations, and preserving heritage and sustainable resources. Earlier, Deputy Chief Minister Tan Sri Datuk Amar Dr James Masing, who is PRS president, advised GPS supporters not to be overly angry about the ‘old wine in a new bottle’ analogy hurled against the coalition by critics. “Many of us are angry with this analogy, including me. But please do not get too angry. That analogy is correct. 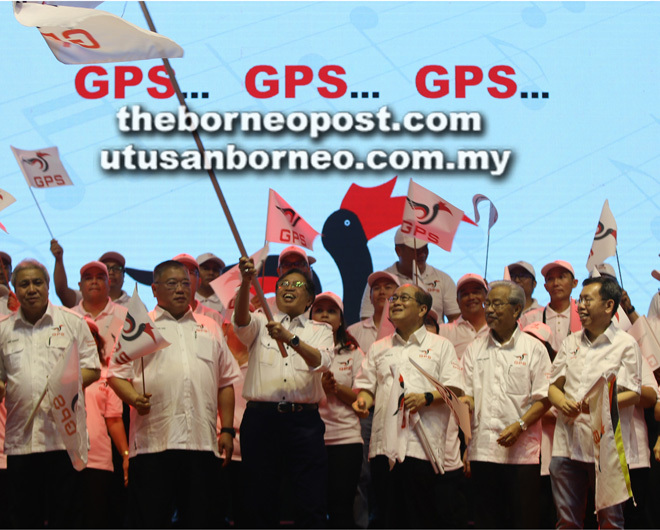 GPS is indeed an old wine in a new bottle,” said Masing, referring to the years of political experience of GPS’ leaders. He said Abang Johari has been in politics for 37 years, while deputy chief ministers Datuk Amar Douglas Uggah Embas and Datuk Amar Awang Tengah Ali Hasan had 30 and 32 years’ experience respectively. “I myself have been in politics for 35 years. Together, we have an accumulated 140 years of administrative experience. Indeed we are old wine. “GPS is a ‘new bottle’ but filled by four different parties who are all purely Sarawak-brewed wine,” he said, drawing cheers from the crowd. On the other hand, Masing said Pakatan Harapan is filled by ‘new wine’ in the form of new MPs, but ‘capped’ by an old cork, hence the fitting analogy of ‘a new wine that is kept in an old bottle’. “As the new wine starts to brew and the fermentation process takes place, the new wine’s gas may burst the old bottle and the cork may pop, and the bottle may break,” he added. Meanwhile, SUPP president Datuk Dr Sim Kui Hian in his speech pointed out that Sarawak is finally ‘free’ after 55 years of being part of a peninsula-dominant political coalition. “We, the four local parties, come together to determine what’s best for Sarawak without the need to worry about Peninsular Malaysia. “We know what’s best for Sarawak. After 55 years, we’ve have had enough. We don’t want to ‘tengok saja’ (watch only),” said the Local Government and Housing Minister. As for PDP president Datuk Seri Tiong King Sing, he said GPS will be the voice of Sarawakians to demand the federal government fulfill promises pledged in their manifesto as well as to adhere to MA63. He believed that the Abang Johari-led GPS would have a loud voice at the federal level due to the chief minister’s firm approach when making demands as well as fighting for the state’s rights. “I would also like to see the (petroleum) sales tax being increased to 10 per cent next year to ensure Sarawak will be able to spur its development plans,” he added. He said through GPS, Sarawakians have full control in determining the state’s future, especially since Sarawak still lags in all aspects of development. Approved by the Registrar of Societies (RoS) on Nov 22 last year, GPS was formed as a new state coalition after its four component parties decided to withdraw from Barisan Nasional (BN) on June 12. At present, GPS has 19 MPs – 13 from PBB, three from PRS and one from SUPP. In Sarawak, it holds 72 state seats with PBB having 46, PRS (11), SUPP (six), PDP (four), and GPS-friendly United People’s Party (five).